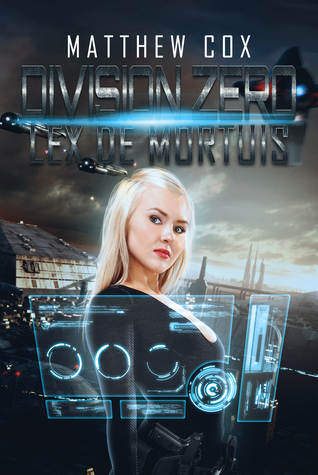 Thanks to the publisher, we are pleased to present an excerpt from the new Matthew Cox sci-fi novel, Division Zero: Lex De Mortuis. Keep reading to check out more about the book! Some soldiers don’t let anything sway them from their mission, not even death from high explosives. Free from her troubled past, Agent Kirsten Wren finds happiness mentoring Evan, a boy with similar talents with whom she soon forms a strong bond. Her efforts to help Dorian settle his past become complicated when a team of corporate “issue resolution consultants” continue their mission to kill a man in the afterlife. Kirsten gets involved when their post-mortem grudge match spills into the realm of the living. At the scene of a surgical explosion that gutted only one floor of a residential tower, she discovers a strange arcane circle drawn in silver. There, she senses energy darker than any wraith she has yet encountered; a force that questions everything she believes about the world. Vikram Medhi, the hacker targeted by Lyris Corporation for elimination, begs her to protect him from undead out to destroy him. With no way to track these spirits, she seeks help from an enigmatic billionaire who offers her more than a simple translation of ancient Sumerian pictographs. Chasing down a dangerous psionic criminal in the oldest lawless zone in the city, trying to protect a man on a corporate death list, and trying to keep both of them from hurting the one person in the world she loves, Kirsten must reach deep within herself to accept her destiny. Kirsten’s run loped to a stagger, and then to a halt. She leaned on the side of a building, gasping for breath. The composite plastic helmet enclosed her head in a claustrophobic cage. A dozen-block run left the visor barely transparent, and trickles of perspiration stung at her eyes, ran down her cheek, and tickled the back of her neck. Tactical armor was a new feeling, a new, heavy feeling; the extra weight on her back and lack of ventilation brought her to a standstill. Deserted, the street held a few abandoned cars as well as fragments of the crumbling buildings on either side. Up ahead, gunfire popped at random from alleys through distant sounds of rioting, sometimes followed by the shriek of a near miss or the howl of a hit. Paper trash skittered by in a faint breeze laced with the fragrance of chemicals and urban rot. Somewhere in the distance, a scream for help echoed; she could not tell if it was a man or woman. “Civil unrest in Sector 77. All Divisions be prepared to encounter armed aggressors.” The digital voice split through her ears; her entire helmet vibrated with it. Gathering a couple more breaths, she jogged ahead, E-90 in hand. The sound of fighting grew louder as she neared the alley from which the plea came. Tight against the wall, she paused to prepare herself before whirling around the corner. Four men, jackets emblazoned with gang markings―The Disowned―surrounded another man half a block down. Cowering in a ball, the object of the gangers’ amusement begged for his life, oblivious to Kirsten’s arrival. “Police, against the wall, now!” she yelled. The Disowned turned at the diminutive shout; outright laughter stalled at the sight of her laser pistol. Whimpering, the victim crawled away from the stilled onslaught. The four thugs raised their hands, but continued to grin as if they were up to something. Kirsten wagged her weapon to the left. “Copy that, en route.” A brief static crunch preceded and followed the voice in her helmet. Kirsten almost shrieked as a boarded up window to her right burst open, covering her with splinters and boards as hands grabbed her by the arm. The E-90 vanished as she went headfirst through the ply-board, landing on her helmet in a cheek slide along the floor of a derelict building. The disorientation of the maneuver left her motionless for an instant, mystified by the echoing clatter of wood in the cavernous empty space. She snapped out of it in time to notice a man about to drive a heavy armored boot into her side. A quick roll got her out of the way and she scrambled to her feet. He kicked hard enough to lose his footing when he missed. Another Disowned, and huge, he recovered his balance and turned to face her, snarling. Faux-denim vest, white shirt, dark skin, muscular, long black hair. She stared at his green eyes. A punch to the helmet snapped her out of it. She ducked a telegraphed kick, avoiding it in just the way he expected her to―right into his waiting hands. He hauled her into the air, throwing her chest-first into drywall. She bounced away, and he grabbed her from behind. Without thinking, she smashed the top of her helmet into his face. His grip weakened; she dropped back to her feet and elbowed him in the gut before spinning into a kick. Her boot caught him across the face. He tottered back, but the hit made him smile. Kirsten growled, pulling the stunrod off her belt and lunging into a wild overhead swing. He caught her wrist and flipped her over. Pain, sharp and brief, foiled her grip on the weapon before she even felt it shooting up her arm as her back hit the ground. Windless, she fogged the visor of her helmet. She rolled upright and backed off, favoring the arm. The urge to knock a few of his teeth out grew strong, but they were so perfect. His face entranced her again. The cute ones are always so shallow. Plus, he is trying to kill me. Adrenaline welled up as he came in with a series of rapid jabs. She blocked each in turn, backpedaling to make him advance. The gleam of a knife at his belt took her eyes off his perfect teeth. The kick caught her blind, in the ribs. She staggered, spraying spittle onto her visor. He faked another stab; this time, she blocked the kick. The knife came around the other way, but she got a forearm across his wrist. Her body jerked from the impact of the block, but she kept her grip and torqued him around by it. Stumbling after his trapped limb, he lost the knife and fell to one knee. Letting his weight take him down, he pulled her into a stumble and kicked her legs out. They rolled away from each other and both stood at the same time. He shook his almost-sprained wrist out as she tried to cradle her left breast through the armor; remembering the wraith claws. Out of the corner of her eye, she spotted the stunrod a few feet away and went for it. He leapt at her, distracting her from the weapon. No longer enamored by his looks, she ducked and spun under his arm, wrapping herself around it and flipping him over with a hip thrust. When he hit the ground on his back, she curled her legs around the limb, heel over his throat. If she did it right, she could break his neck. The man howled through her attempt at a pain submission hold. She twisted a little harder and he stopped fighting. Tingles spread through her body, riding the forefront of a wave of numbness. Paralysis settled in and she went limp on the concrete. Brightness intensified, washing out the details of the ceiling until all that remained of it was flat white light and grey blobs. “Simulation: End,” chimed a pleasant, omnidirectional female voice. Born in a little town known as South Amboy NJ in 1973, Matthew has been creating science fiction and fantasy worlds for most of his reasoning life. Somewhere between fifteen to eighteen of them spent developing the world in which Division Zero, Virtual Immortality, and The Awakened Series take place. 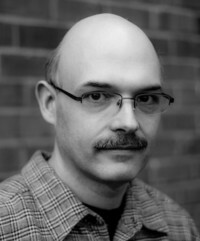 He has several other projects in the works as well as a collaborative science fiction endeavor with author Tony Healey. Hobbies and Interests: Matthew is an avid gamer, a recovered WoW addict, Gamemaster for two custom systems (Chronicles of Eldrinaath [Fantasy] and Divergent Fates [Sci Fi], and a fan of anime, British humour (<- deliberate), and intellectual science fiction that questions the nature of reality, life, and what happens after it. He is also fond of cats.